10 Reasons To Implement A Drug Free Workplace! Often times employers are hesitant on implementing a Drug Free Workplace Program because they believe that if an employee tests positive the employee, must be terminated. This may not be the case, consequences for a positive test result must reflect the companies Drug Free Workplace Policy. One option is termination; however, employers may offer a second chance provision rather than termination if it is specified in their Drug Free Workplace Policy. Why should I implement a Drug Free Workplace Program? Employers often as what are the benefits of a drug free workplace program. Below are the top 10 reasons or steps to implement a drug free workplace policy. Create and implement a written drug free workplace policy. To create a drug-free policy at work, a business has several options. All policies should be in writing, effectively communicated and documented that is was delivered to all employees. 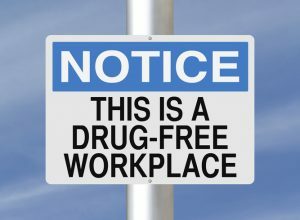 Implementing a drug free workplace will assist you in creating and maintaining clear rules and consequences of using drugs or alcohol during work. This would help create a safe environment which would help reduce drug or alcohol related accidents and/or liability issues. Typical side effects of drug or alcohol use include absenteeism, tardiness or lack of productivity. Furthermore, employees who use drugs are more likely to job hop three or more times in a year than non-users. Help prevent these behaviors by instituting a drug-free workplace policy, setting the company standard and holding workers accountable. By implementing a drug-free workplace program, employers will demonstrate a commitment to having a safe, healthy work environment. Studies have shown that drug users cost employers twice as much in workers’ compensation claims and medical expenses as non-users. By reducing drug use among employees, you can help lower workers’ compensation claims and save money. Many states have instituted Laws that provide a discount on workman’s’ compensation premiums to encourage businesses to implement drug-free workplace programs. States with such laws include Florida, Georgia, Texas, Virginia, and Washington. Employers in these States have the ability to receive anywhere from 5% and in some cases as much as 10% credit if they qualify as a State Drug-Free Workplace Program under the statute. A proper drug-free workplace program should contain an educational component that notifies employees on the health and safety risks drug use imposes. This education should be ongoing and documented. A drug-free workplace program demonstrates to employees that you have a vested interest in their health and safety. By providing helpful resources, such as education, training, confidential hotline numbers or names of treatment centers, you demonstrate your commitment to seeing your employees get help and improve their quality of life. Benefits from implementing a drug-free workplace program include lower absenteeism, increased productivity, reduced workers’ compensation filings, and fewer accidents. Additional savings include improved employee morale, creativity and emotional stability. For more information on the benefits of implementing a Drug Free Workplace, call us today! (800)-488-5350 or click here to submit your request. Visit our YouTube Channel For More Information! Previous: What Is The “New” DOT Drug Test?